Music can transcend the mundane, bringing us in solidarity with our community in a truly sacred experience. At Congregation Har HaShem, we are blessed with outstanding music. With leadership from Cantorial Soloist Holli Berman on the bima each Shabbat, our monthly 2nd Shabbat Musical Service led by Har HaShem's band, Or Zimrah, the voices of our youth choir, Kol No’ar, teen songleaders, and vibrant congregational participation, there is always an entry to express joy, sorrow, or longing through prayer, melody, and song. Our music inspires. Come sing with us! Listen to some of our Friday evening prayer melodies here. Listen to our Saturday morning prayers here. View a list of song composers here. Do you love to sing? Do you love Jewish music? Our wonderful adult choir meets two Wednesdays a month to learn together, sing, and deepen our Jewish connections. We help lead services on occasion, bringing beauty and depth to our worship experience at Har HaShem. Contact Cantorial Soloist Holli Berman for more information. Or Zimrah (Radiant Song) is the band of Congregation Har HaShem. Or Zimrah leads services on the second Friday of each month, bringing Jewish music and prayer a contemporary and inspirational edge. For more information, contact Cantorial Soloist Holli Berman. Listen to some of our music here. Various Guest Artists on cello, ukelale, etc. Kol No'ar (Voices of Youth) is the youth choir of Har HaShem run by Cantorial Soloist Holli Berman. 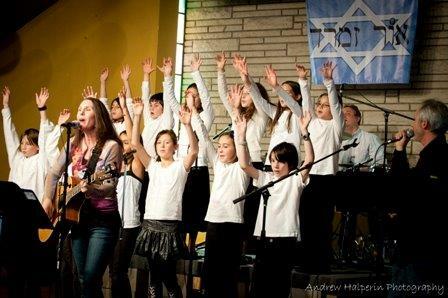 Students learn vocal technique, performance skills, harmony, and wonderful Jewish music. Students sing and help lead a Har HaShem worship service. For students in Kindergarten through Fifth Grade.